Elimination of its native habitat and uncontrolled hunting exterminated most of the elk from the eastern half of America before most western expansion began. However, the vast herds of bison and elk that roamed the western grasslands astounded pioneers moving over the endless prairie. But with this western migration came one of the most shameful and tragic eras of wildlife exploitation. Hide hunters slaughtered hundreds of thousands of bison for nothing more than their hides and tongues. As the bison harvest dwindled, market hunters turned their attention to the elk. Eastern tanners found the elk hide to be much more pliable than bison, so they began paying $7.00 for an elk hide, as opposed to only $4.00 for a bison hide. Elk by the thousands were slaughtered. The only edible part saved was the tongue. By 1890 elk were thought by many to be extinct. It was only in those remote mountainous regions that a few scattered pockets of elk survived. Those few survivors were the descendents of today’s elk. Two dramatic changes occurred in the early 1900’s, on natural and one man-made, which greatly changed the status of the elk in America. In 1910, wildfires roared through the dense virgin forests throughout the West. Many billions of dollars in valuable timber were lost. In the fire’s wake was left a desolate moonscape that no one that could ever recover. But within three years, a soft carpet of grass covered these burned areas, and the once secretive elk was often seen gorging on this succulent vegetation. Elk numbers rose sharply, but with no control over their harvest, the elk was still in danger. Farsighted conservation-minded men, such as Teddy Roosevelt, were able to stop all hunting until the elk recovered sufficiently. In 1920, about 20,000 elk were harvested, and the harvest increased until it hit a high of about 140,000 in 1960. Fifteen years ago, a fantastic elk conservation organization, called the Rocky Mountain Elk Foundation, was formed to protect and conserve elk and elk habitat. The RMEF has been able to set aside hundreds of thousands of acres of critical elk habitat for the perpetuation of the species. The RMEF has also begun an aggressive transplanting program, in conjunction with state wildlife agencies, to return the elk to many of its former haunts. 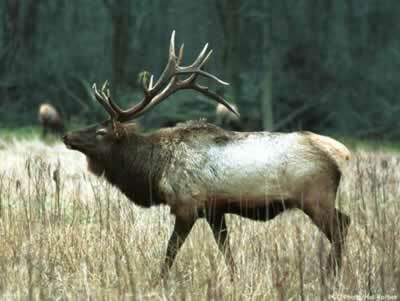 Today, elk have been reintroduced back to the Dakota’s, Michigan, Pennsylvania, Kentucky and Arkansas. But even more important than that, the RMEF has touched the country’s conservation nerve, and many corporations and individuals are coming forward to help the cause of this fantastic animal.